JGarden Description: This 2.3 acre garden, created by a self-taught landscape designer and owner of the Asticou Inn to preserve for Mt. Desert Island the plants from the Beatrix Farrand estate, displays over 20 varieties of azaleas in a setting that includes a stream, an iris-bordered pond and a meditation garden. The garden is actually part of what is known as Asticou Terraces, created by Boston landscape architect Joseph Henry Curtis. Many of the existing plants were brought from Reef Point, the shorefront estate of landscape gardener Beatrix Farrand. After the Bar Harbor fire in 1947, the Farrand property was sold and Charles K. Savage bought the entire collection of plants (including azaleas, rhododendrons, mountain laurels, cedars and hemlocks) from the estate in one lot and divided it between Thuya Gardens and Asticou Gardens with financial assistance from John D. Rockefeller Jr. Other plants have been purchased from growers in Massachusetts in the years since. Today the gardens are owned and maintained by the Island Foundation. There's more on the history at http://www.asticou.com/history.html. 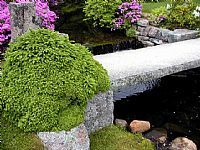 The garden includes a stream, ponds, bridges, stone paths, a dry garden, stone lanterns, moss and pruned trees. The head gardener is Mary Roper. If you visit, be sure not to miss nearby Acadia National Park.